Selecting a new ERP system for your manufacturing company can be a daunting task. The Ultimate Manufacturing ERP Glossary provides a solid starting point to understanding common and advanced terms associated with manfacturing systems. Empower yourself with these definitions to make informed decisions about your future ERP solution. 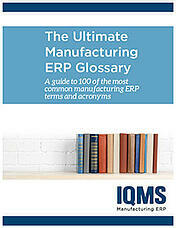 Download the Ultimate ERP Glossary Now!